Despite claiming to be “open and honest in our dealings”, The ChampCoin provide no information about who owns or runs the business on their website. The ChampCoin website domain (“thechampcoin.com”) was privately registered on January 25th, 2017. Further research reveals The ChampCoin marketing presentations naming Mahesh Verma as founder of the company. According to his LinkedIn profile, Verma is based out of Haryana, India. Prior to launching The ChampCoin, Verma (right) launched ChampCash. 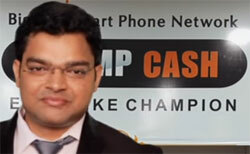 ChampCash pays affiliates to install apps. Each install generates a referral commission, which ChampCash share with affiliates via an MLM compensation plan. This decline has likely prompted the launch of The ChampCoin. Read on for a full review of The ChampCoin MLM opportunity. The ChampCoin has no retailable products or services, with affiliates only able to market The ChampCoin affiliate membership itself. The ChampCoin affiliates invest in ChampCoin points on the promise of an advertised 9% ROI every 6 months. ChampCoin is not publicly tradeable and is only available through a The ChampCoin app. The ChampCoin affiliates trade ChampCoin through the app, with new affiliates required to buy 50 ChampCoin from the company at the current rate. The ChampCoin maintain complete control over the assigned value per ChampCoin. The ChampCoin pay affiliates to recruit new affiliates via a unilevel compensation structure. Note that the above recruitment quotas must be “active affiliates”. I couldn’t find any information as to what constitutes an active affiliate within The ChampCoin. The ChampCoin affiliate membership is free, however affiliates must buy 50 ChampCoins from the company to participate in the attached MLM opportunity. The current value of ChampCoin is not provided on The ChampCoin website. ChampCoin does appear to have some functionality through The ChampCoin app, however this isn’t direct usability with third-party merchants. An affiliate indicating to The ChampCoin they wish to purchase something and then The ChampCoin making the transaction happen in fiat currency clearly isn’t third-party adoption. That aside, ChampCoin is the same as any other MLM pump and dump altcoin. More Ponzi points than cryptocurrency, ChampCoin is worthless outside of the internal The ChampCoin exchange. The internal value of ChampCoin is set by the company, which is how The ChampCoin are able to promise a six-month 9% ROI. This obviously isn’t how a legitimate cryptocurrency works, and is why ChampCoin isn’t publicly tradeable or listed on any reputable public exchange. With real money exchanged for worthless ChampCoin, The ChampCoin will be able to pay ROI withdrawal requests through the internal exchange as long as new money continues to flow in. Once The ChampCoin affiliate recruitment slows down and so too with it new investment, kaboom.